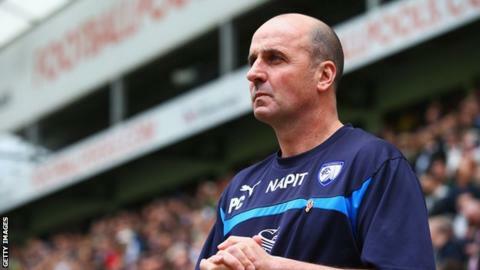 Chesterfield boss Paul Cook has agreed a deal to take charge of Portsmouth, BBC Radio Sheffield reports. The 48-year-old was in the dugout as the Spireites were knocked out of the League One play-offs following a 3-0 defeat at Preston on Sunday. League Two side Pompey were refused permission to speak to Cook in April following the departure of Andy Awford. It is understood that assistant Leam Richardson is under consideration for the manager post at the Proact Stadium. But former Wolves and Doncaster boss Dean Saunders and ex-Sheffield United striker Brian Deane are also believed to be in the frame. He guided them to last season's League Two title and their good form continued in this campaign, securing a play-off spot with a sixth-placed finish.